South Western West Virginia Region 2 Workforce Investment Board, Inc. announces the release of Workforce Innovation and Opportunity Act (WIOA) funding to organizations interested in providing youth workforce development services to youth ages 16-24. Details on the Request for Proposal (RFP) for Comprehensive Out of School Youth Program can be found here. Please click here to access the State Plan. 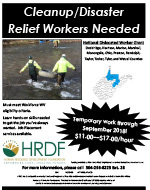 Governor Jim Justice and WorkForce West Virginia Acting Executive Director Russell Fry announced today that Disaster Unemployment Assistance (DUA) benefits will be available to qualifying persons residing or working in Harrison, Marshall, Wetzel and Marion Counties. These counties were given major disaster status by Governor Justice and President Trump on August 18, 2017. Read more. 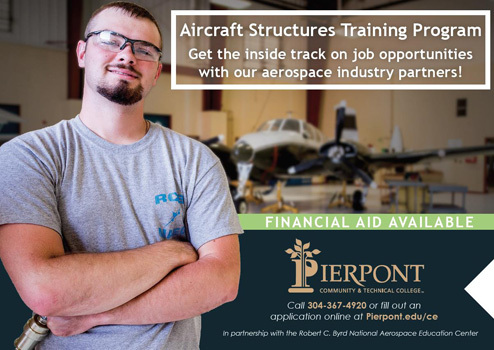 Aircraft Structures Training Program is a successful 8-week class to prepare individuals for a new career in airframe repair and assembly, in collaboration with local aerospace companies actively hiring entry-level workers. We can help if you’ve been laid off from the mines. There’s federal money for classes and training for you and your spouse. Even your gas is covered. Read more.